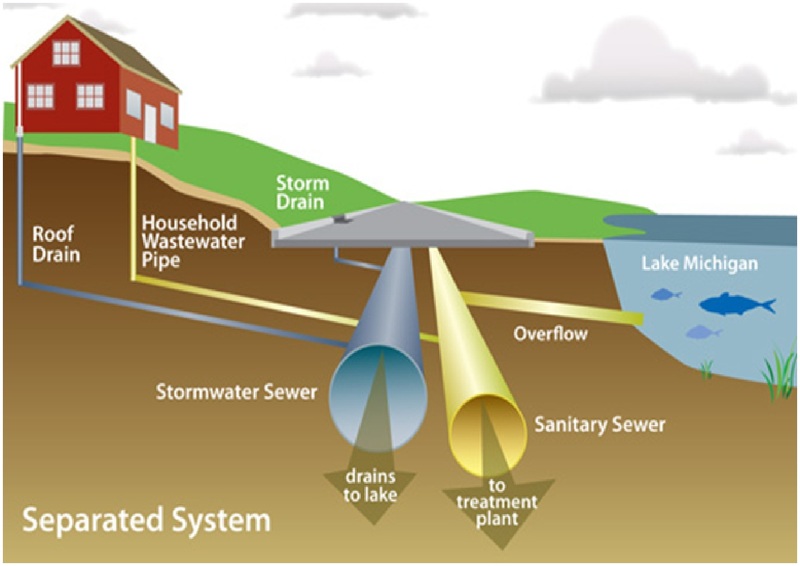 Some of the important and relevant terms for sewer system are discussed below…. 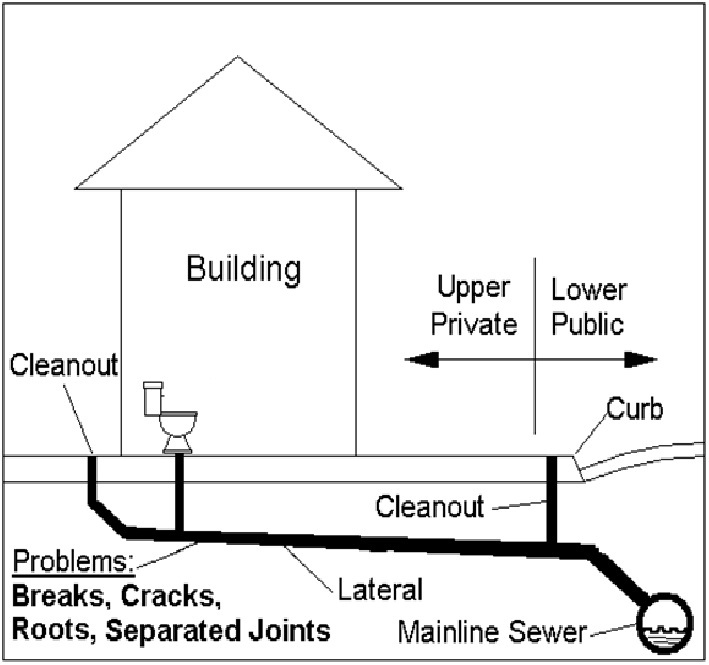 It is the sewer conveying sewage from plumbing system of building to common/municipal sewers. It receives discharge from two or more sub-mains. It receives discharge from all collecting system and conveys it to the point of final disposal. It is flow derived from the sanitary and industrial sewage that is the raw water from these industries and houses, so it means it has direct relation with the amount of water consumed. Like water supply, sewage flow varies from time to time. 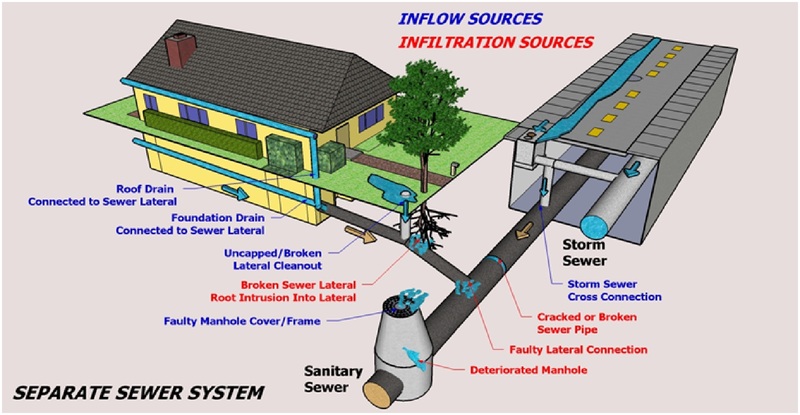 Since sewers must be able to accommodate Maximum Rate of Flow, the variation in the sewage flow must be studied. It is nonexistent during dry weather but increases during rainy season. Water and Sanitation Agency (WASA) Lahore uses the following infiltration rates for the design of sewer system. Rate of Flow are average daily, peak and minimum flow including Infiltration. This design is based on partially combined sewerage system thus is economic. All the necessary things are taken from the WASA tables and Minimum velocity is taken as 0.6 m/sec which is the self cleansing velocity and velocity must not be more than 2.4 m/sec. Minimum diameter of sewer is taken as 225 mm and other diameters are rounded to the locally available in the market according to WASA standards. Minimum rate of sewage flow is taken as 50% of average sewage flow. Minimum clear cover of 1-m is provided above the sewer in order to avoid from impact of live loading. Diameters are less then 600mm so Infiltration rate used is 5% of average sewage flow. Bell & Spigot joints have been used as the diameters are less then 600mm. One Drop Manhole is coming at M15 as the vertical drop is more than 0.6m. In Sewers (M9-M8, M8-M11, M10-M11, M12-M13, M5-M18, M20-M21, M24-M21, M21-M22, M25-M26), Velocity is less than the self cleansing velocity So, Flush tanks will be provided here. Most of the diameters are of 225mm ensuring the economic side of the project. 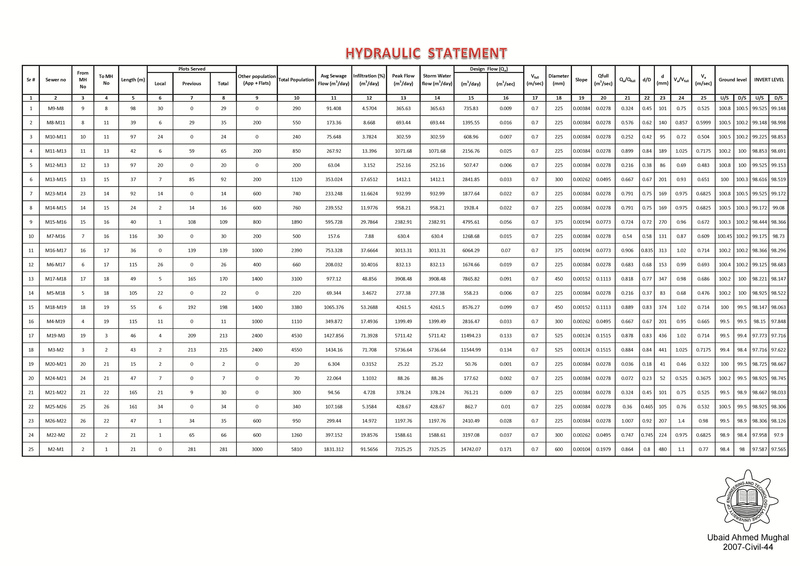 Wet well dimensions are 2.5×3.5×4.4. Cycle time of 15 minutes is satisfied ensuring the adaptability of small pumps so more economic. Flush tanks should be flushed once in 24 hours to avoid sediment deposition. If the sewer is to be laid under the water table then crushed stone bedding should be used. Sewers should be joined in a manhole keeping the crowns at the same level. I am working as Sub Engineer at a TMA. I got enough guidance from work good work. Very good material, it will be more beneficial if you could have shown the calculation or uploaded supporting excel file. I WOULD LIKE TO BUY PROGRAM FOR DESIGN SEWAGE NET WORK WITH PROFILE. All softwares available on the site require membership. Thanx alot. This article was a lifesaver. I am doing something similar for my undergrad project. Is there information on ABR (Anaerobi Baffle Reactor) sizing and formulas? Hello sir your work is very appreciable, sir can you plz tell me how many types of networking are there in sewerage system and what are their names. And also where does the peak facor like 4.5,4,3 come from. Hope u would consider my question. 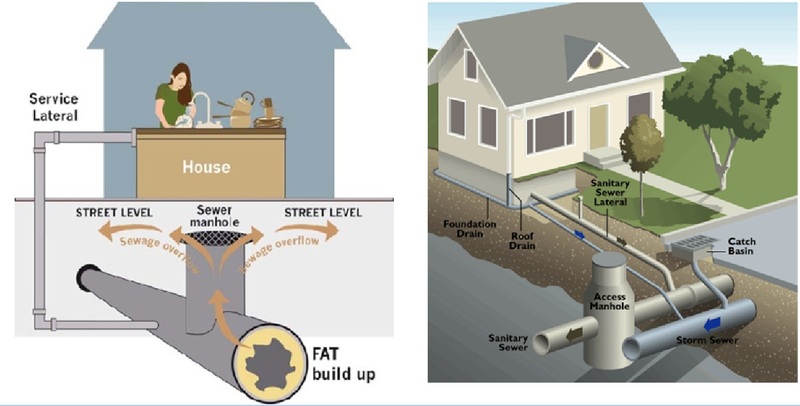 You will be using all parameters of separate sewer system like discharge, self cleansing velocity etc. 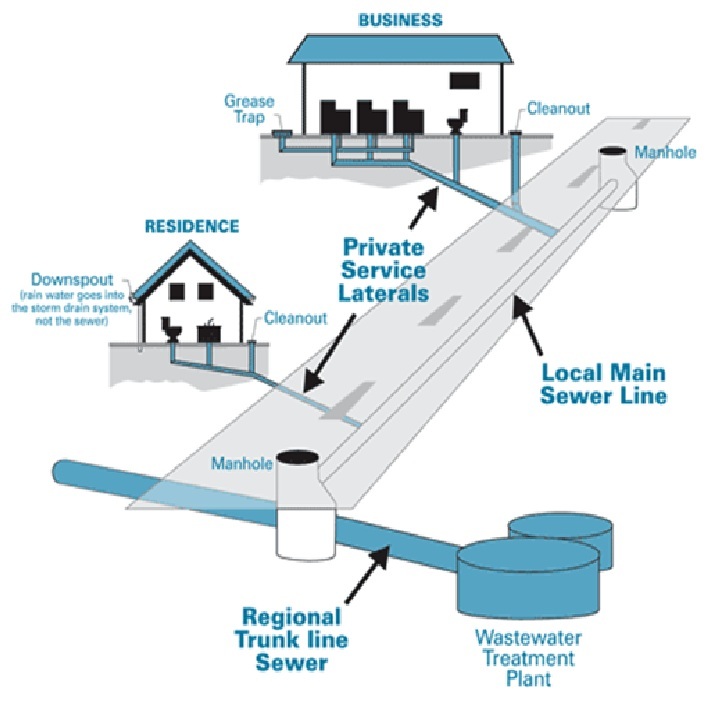 could you please give me an example of the Analysis statement for main sewer for any area? This was really helpful, i m working on my college project and this kinda helped me save time to go through all the literature regarding design as m already running short of it. Thank you! You’re Welcome 🙂 We are glad that it helped you. I am a student at the University of Wisconsin – Stevens Point. For a interpretive media class I have to design a sign for a local waste water treatment plant in Green Bay to use to educate their visitors. I am looking for an image of a separate sewer system to use in the sign and came across a couple on your website that would be perfect. I was wondering if you would allow me to use any of your images and if you have any high quality versions of them? You can click on them and download them as per your requirement. The site was worth visiting for me. it was indeed which helped me the most in doing my final year project in Diploma course this year. so i would like to thank and say i am very pleased to get accessed to this. thanks for the helps. Samajh Aani chahiye ta k khud kar sako. what is the minimum threshold for opting separate sewerage system in terms of Indian conditions? Thankyou very much. 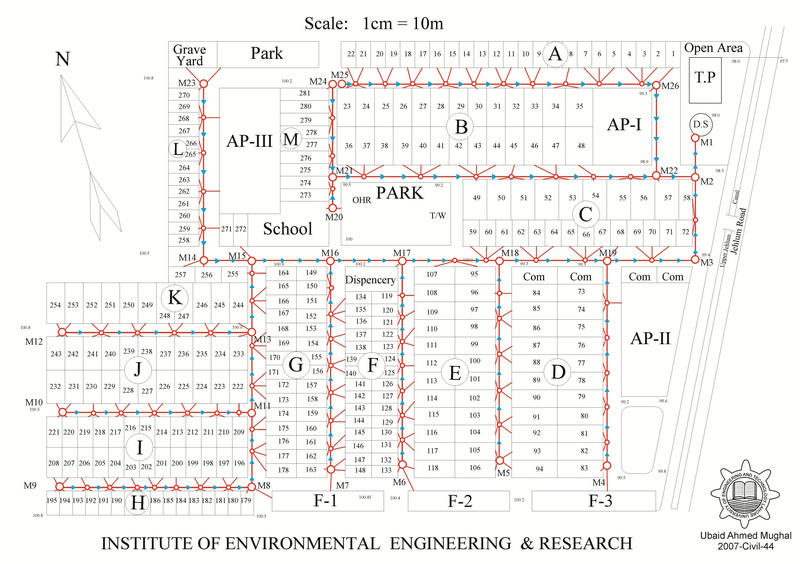 I just found the solution to all my civil engineering problems. What a perfect lesson. I really appreciate the efforts and time you have spent preparing this. How far from a residential house should a main sanitary sewer manhole be? I’m talking about the one that usually goes in the middle of the street. One was covered up when my house was being built last year and it’s only 15 feet from my front door in my front yard. It’s also a major T- junction for the neighborhood. The metropolitan sewer district said the developer idefinitely put it in the wrong place and it should have been in the street or in the sidewalk. I just don’t know what the codes are for Kentucky. how i can cite it? 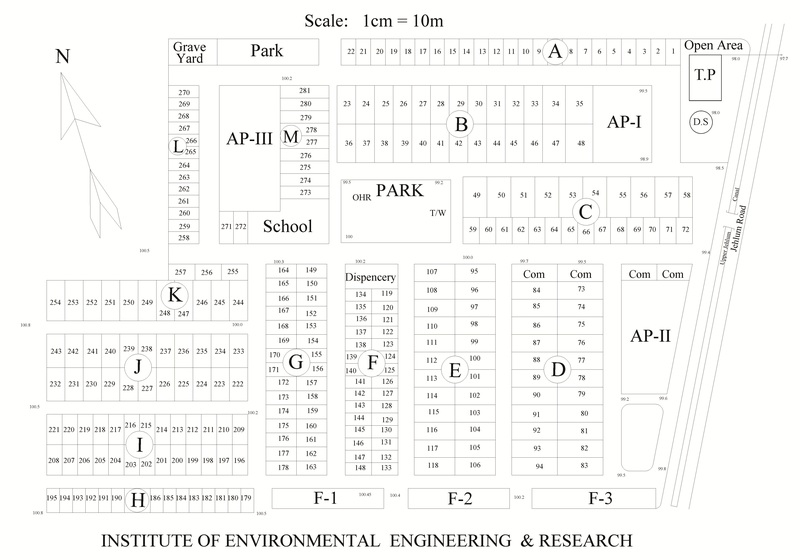 We take Sewerage system design project in final year in UET Peshawar Bannu campus..We use your pattern to design the sewer..plz mention the softweres u used in layout of sewer..